LAS VEGAS – Nearly a month to the day earlier, in the same chair in the same room as Timothy Bradley was sitting, Floyd Mayweather Jr. went on an impassioned rant about performance-enhancing drugs in boxing. Mayweather's fire was ignited when he was asked if he'd ever fight Manny Pacquiao. Mayweather jumped out of his chair, paced around the room, animatedly pounded his chest and said his health was more important to him than any amount of money or winning any boxing match. The implication was obvious, that Mayweather believes Pacquiao's success was, at least in part, the result of performance-enhancing drugs. Bradley, who will challenge Pacquiao on Saturday for the World Boxing Organization welterweight title in a pay-per-view bout at the MGM Grand Garden, doesn't share the same concerns as Mayweather. He's so eager to prove that he's one of the world's elite that he'd fight Pacquiao even if he had proof Pacquiao had used an illegal substance. "He's going to have to be on something to beat me," Bradley said with a shrug of his shoulders. Pacquiao is better than a 4-1 favorite to retain his title and win his 16th fight in a row, but Bradley scoffs at the odds. He's unbeaten, too, but he's far less known and few are likely to bet on him. As a result, bookmakers pushed the number higher on Pacquiao anticipating heavy action on him. That, though, has no impact on Bradley or his belief in himself. He's chased the dream of a mega-fight for years, since his amateur days, and has always seemed to be on the outside looking in when the big matches were made. This time, he landed the big one and isn't going to let anything – not even PEDs – get in his way. He said that even if he saw Pacquiao injecting himself, he would still take the fight. "Hell, yeah," Bradley said. "Why not? Take whatever you want. It don't matter to me. I don't care. Someone said to me, 'What about drug testing?' I said, 'I don't care.' It don't matter to me. He's going to need it." 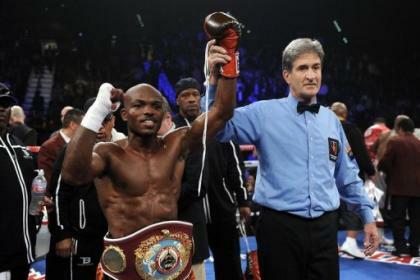 Bradley has exuded a quiet confidence since the day the fight was made. Throughout training camp and fight week, his calm demeanor has never changed. It is, Pacquiao insiders say, eerily similar to the way Pacquiao conducted himself before he fought Oscar De La Hoya in 2008. Most in the media gave Pacquiao little chance to win, believing that De La Hoya was far too big, but Pacquiao and his team had a quiet confidence that was noticeable to all who encountered them. It was vastly different than the attitude Team Pacquiao displayed in the days before Pacquiao's fight with Juan Manuel Marquez in November. Then, it was a confidence that bordered on cockiness. Alex Ariza, Pacquiao's strength and conditioning coach, was dismissive of Marquez and predicted Pacquiao would win by a first-round knockout. Neither Pacquiao nor trainer Freddie Roach was as bold, but each insisted they'd learned extensively from their first two fights with the great Mexican what it took to beat him. They were, like Ariza, assuring all who asked that Pacquiao would score a clear-cut victory and end any debate about who was the better man. As it turned out, Pacquiao was fortunate to escape with a majority-decision victory, though his reputation as an unbeatable force of nature took a major ding. Pacquiao is 33, an age when fighters begin to slip, particularly those closing in on 60 fights. But Pacquiao was also dealing with marital issues and his attention wasn't entirely on the task at hand. Whatever the reason for his lackluster performance, he'll need to step it up against Bradley, who has a good counter-punching style like Marquez but is significantly quicker. Pacquiao knows it and insists he's pushed himself to his limits in preparation for a significant challenge. "Tim Bradley is a hungry fighter, and young," Pacquiao said. "I know how he feels. That's why I trained like I was 20 years old. My team wanted me to stop training, but I kept pushing more and more because I know Bradley is inspired." Joel Diaz, Bradley's trainer, concurred with Pacquiao on that. Diaz said he's rarely come to the gym in his nearly eight years of training Bradley and seen him give anything less than an all-out effort. But he said there's been a spark to Bradley this time around that he believes is indicative of something special. Diaz predicted that Bradley will hand Pacquiao his first defeat since a loss to Erik Morales on March 19, 2005. "You don't see (major upsets) come around that often," Diaz said. "But I think we're up for one. I think Saturday night is going to be the upset of the decade."